Cash Shop Update for November 22 | Dexless, Maplestory Guides and More! November 20 to November 27 in the Special Promotions > Black Friday category in both Reboot and non-Reboot worlds. It’s Black Friday week, and there are different daily deals and limited quantity sales each day! Be sure to check our Sales page for all of the details on this year’s Black Friday deals. November 22 to November 29 in the Appearance category in both Reboot and non-Reboot worlds. Check out the Male Hairstyles available now: Bed Head Hair (NEW! ), Contrast Bangs (NEW! ), Forest Fairy Hair, Wavy Mop, Slick Shine Hair, and Shy Boy Hair. Check out the Female Hairstyles available now: Star Student Hair (NEW! ), Eternal Wind Hair, Forest Fairy Hair, Matilda Hair, Orchid Hair, and Wavy Bob. Check out the Male Face Styles available now: Wow Face (NEW! ), Nine-Tailed Fox Face (NEW! ), Puppy Eyes Face, Sparkling Face, Forest Fairy Face, and Come On Over Face. Check out the Female Face Styles available now: Friendly Friend Face (NEW! ), Baby Face (NEW! ), Forest Fairy Face, Sleepy Face, Female Evan Face, and Creepy Face. November 22 to November 29 in the Special Promotions > Limited Time category in non-Reboot worlds only. Turkeys aren’t just for eating on Thanksgiving! Take home your own little Turkey pet. It comes with an equip to wear, yummy pet food to eat, a Pet Name Tag, and several useful pet skills and scrolls. November 22 to November 29 in the Special Promotions > Limited Time category in both Reboot and non-Reboot worlds. Dress up in the classic Veamoth Outfit, available as male and female versions. These items are permanent! November 22 to November 29 in the Special Promotions > Limited Time category in Reboot world only. Let the little Turkey pet join you on your adventures in Reboot World! November 15 to November 29 in the Special Promotions > Limited Time category in both Reboot and non-Reboot worlds. Do you need a fun chair for when you’re hanging out in Maple World? Use the Chair Gachapon Ticket, guaranteed to give you one amazing chair! And if you purchase it now, you can get it at a discount! Relax in a beautiful dream with the Octopus Fish Tank Chair, Crystal Memories Chair, Mermaid's Coral Reef Runner, and Butterfly Love Flower Chair. November 15 to November 29 in the Special Promotions > Limited Time category in non-Reboot worlds only. Get prepared for Black Friday! 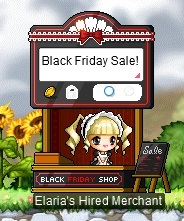 Set up the Black Friday Shop in the Free Market and the shop will sell items for you, even while you are logged out.